It is an unspoken acknowledgement that Back to the Future, Part II brought to life the vision of the future that many of us have in our heads. While we may still be lacking hoverboards, however, it appears that Apple may finally have dragged video-calling into the mainstream with the iPhone 4’s FaceTime feature. In and of itself, video-calling is hardly new—companies have been trying to sell consumers on it for decades. But if there’s one company that can bring the technology from exception to everyday, it’s probably Apple, and the folks from Cupertino have certainly given it their all, as evidenced by FaceTime’s elegant simplicity. All you need is a Wi-Fi network, an iPhone 4, and a friend with an iPhone 4 and a Wi-Fi network—chances are you’ve already got the first two, no problem. To initiate a FaceTime call, you have a few options. As Steve Jobs demoed during his WWDC presentation earlier this month, you can make a voice call as usual and then switch over to a video chat by hitting the FaceTime button, which lives where the Hold button used to (and still does if you have FaceTime disabled). You can always decline a FaceTime invitation if you find yourself feeling less than photogenic. At this point, the recipient will be presented with a screen allowing them to decide whether or not to accept the FaceTime request. If you deny it, you’ll stay on the phone sans video. If you accept it, you’ll be launched into FaceTime. It’s also good to remember that once initiated, FaceTime calls don’t use up either your minutes or your cellular data plan. In addition, you can directly initiate a FaceTime call, with no need to rely on AT&T (or your cell phone provider) at all. There are two ways to do so: first, if somebody has made a FaceTime call to you recently, you can just tap on their entry in the Recents section of the Phone app—it’ll be marked as a FaceTime call. Otherwise, you can bring up their contact info in the Phone or Contacts apps, scroll down to the bottom, and tap the FaceTime button. (It will show a video camera icon if that person is confirmed to have FaceTime capabilities, i.e., someone you’ve already had a FaceTime call with). Accepting a FaceTime call is pretty similar to accepting a phone call: if your phone is currently in use, your current app will disappear and you’ll be shown a message saying a contact has requested FaceTime with you. The front-facing camera will activate and show an image of you, and you’re presented with a green Accept button and a red Decline button. If your phone is locked, you’ll see a green slider prompting you to answer the FaceTime call; you can decline by pushing the Sleep/Wake button. The basic video chat interface, with controls for muting, hanging up, and swapping cameras. 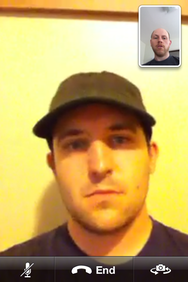 If you’ve ever had a video chat session in iChat, FaceTime will look pretty familiar. The majority of the display is taken up by the video of your conversation partner, along with a small thumbnail image of what your own camera is showing. There’s also a small translucent menu bar at the bottom with three options: Mute, End, and swap cameras. Mute will kill your microphone—which, incidentally, is the top microphone on the iPhone 4, the one next to the headphone jack—but it won’t turn off video. If you want to turn off the video, but keep the sound going, just press the Home button. The iPhone will take you back to the Home screen, but the call will keep going. Just as with a normal phone call, you’ll see a pulsing green band at the top that you can tap to return to the FaceTime call and reactivate video. While you’re gone, your conversation partner will see a “Paused” icon over the last frame of video that was sent. In my brief tests, video resumed instantly when the other person returned to the call. One downside, however, is that even if the video feed isn’t active, the FaceTime call will remain on speakerphone; there’s no way to switch over to the iPhone’s earpiece. The third button in the menu lets you switch between the iPhone 4’s front-facing camera and the rear-facing camera, allowing your conversation partner to feast their eyes on something besides your smiling face. That’s handy when you want to show them something without having to turn the screen away from you—broadcasting a video of your kids to a traveling spouse, for example. 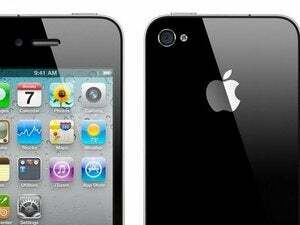 You can always turn the phone into landscape mode, and you can switch between the iPhone's front and back cameras. Of course, you can also turn the phone into landscape orientation for a wider video picture, though keep in mind that if your conversation partner is still in portrait, you’ll usually end up with unsightly black bars filling the empty space. Also, in case that little picture-in-picture of your own mug gets in the way of your friend’s, you can drag the thumbnail to any corner of the screen; you cannot, however, hide it completely—if you try to drag it off the screen, it’ll snap back to the nearest corner. 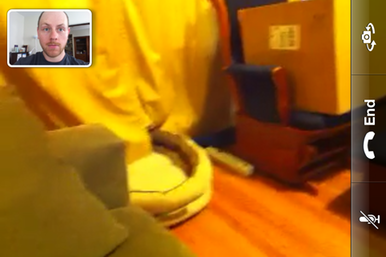 Overall, the quality of FaceTime chats were impressive. Video, while hardly flawless, was perfectly watchable, and the audio is better than on a normal phone call, thanks to the heftier Wi-Fi connection. However, video-chatting appears to be moderately intensive, as both my iPhone and one of my conversation partner’s phone got on the warm side after about a ten-minute call. It will also probably drain your battery life, though we didn’t specifically test by how much. Though in most of my experience FaceTime worked automatically, with no configuration, I did run into one problem when I tried to connect with a friend at her workplace. Due to what we concluded was some sort of firewall or agressive filtering software, we were unable to establish a call—a later test with her at home worked perfectly, however. If you’re loath to have anybody ever initiate a video chat with you, then don’t worry: take a trip into Settings -> Phone and flip the FaceTime slider to off. You won’t be bothered with FaceTime requests at all. 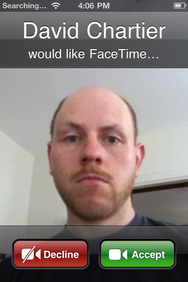 Conversely, if you’ve been having trouble receiving FaceTime calls, as I did at first, you’ll want to flip this on. Will FaceTime really get video-calling to catch on? It’s hard to say, but with the smooth, slick it-just-works way that Apple’s implemented FaceTime, it will certainly be tough to point a finger at the technology as the culprit. And, as the marquee feature of a device with more than 600,000 pre-orders, combined with Apple’s plan to open the FaceTime standard to others, I’d say video-calling has a better chance than ever.